Screen capture of the Facebook post that shows a mom smoking marijuana while breastfeeding. A photograph posted on Facebook has sparked a worldwide debate. 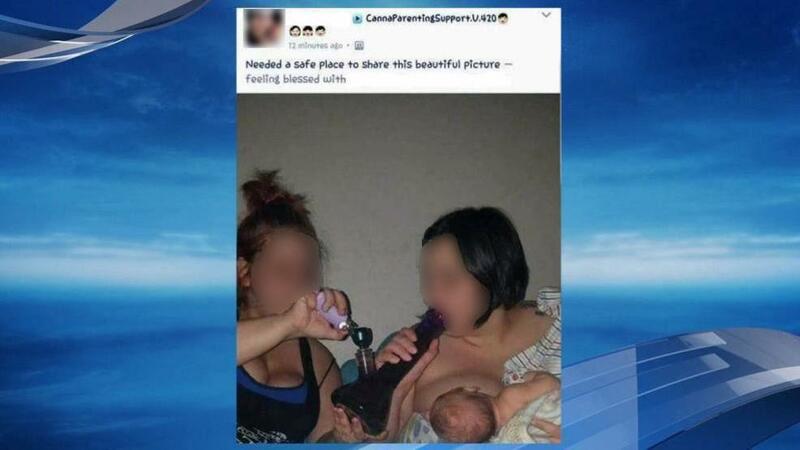 It shows a young mother breast-feeding her baby all while seemingly smoking weed from a bong just inches from her baby’s head. The mother is from Portland, and earlier this week, she posted the photo to a cannabis and parenting support group saying, she "needed a safe place to share this picture." The photo upset many parents. “My issue is not that the mom is consuming postpartum, it’s that the mom is consuming with a baby in her arms,” said Jenn Lauder. Lauder is the co-founder of Splimm, a website that supports parents who use cannabis. “I am not one to jump to judge or shame other moms,” she said. But she said this photo went too far. “Any time when there is a possibility that a child is endangered, that's a line we have to draw,” Lauder said. Another poster says, "My boyfriend would do this for me when I breast fed; of course you have to lean over so you don’t bump their head or light their little hairs on fire." Lauder says while she supports parents who choose cannabis, she and her group hope to educate parents how to do so responsibly. “Part of our mission is to educate moms who want to consume and choose cannabis. We want to provide her with resources and alternative models of how you might do that in a responsible way,” Lauder said. The American Academy of Pediatrics, though, says cannabis can be transferred to babies through breast milk. “Street drugs such as PCP (phencyclidine), cocaine, and cannabis can be detected in human milk, and their use by breastfeeding mothers is of concern, particularly with regard to the infant’s long-term neurobehavioral development and thus are contraindicated,” it says.